What’s New in the Hoss Test Gardens? We are always trying new things in the Hoss Test Gardens. We love to grow our own vegetables and we are eager to try new ones. If we like a new one and are successful with it, we will usually add it to the yearly rotation. However, in some cases growing new things may not work out as planned. This could be due to incorrect climate, disease susceptibility, or simply that we just didn’t like the taste or texture of it. Below are the new things we are trying this year and that hopefully we will be successful in growing for years to come! We got these seeds from Bill’s Big Pumpkins and we are hoping to grow some giant pumpkins ourselves! These are labeled with a marker according to the parent name. Be on the lookout for some awesome pictures if these grow as big as advertised. We grew this in our high tunnel greenhouse this year and it has done really well. 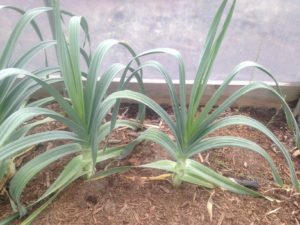 It is not a “true garlic,” but is actually a variety of leek. We planted it quite a while ago and we are still waiting for the leaves to brown before harvesting, so it’s fair to say that this one requires plenty of patience. 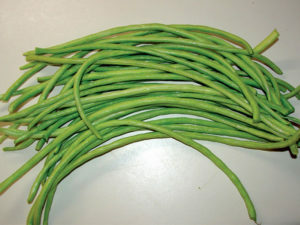 We planted these long, running beans from seed directly in the garden and had a good germination rate. We have a panel trellis set up for them to climb. These beans are supposed to get about a foot long and are said to be great for stir-fry. Chia seed is a great “superfood” that we are going to try and harvest ourselves to save money at the local natural foods store. We started these from seed in the greenhouse and transplanted the plants into the garden. 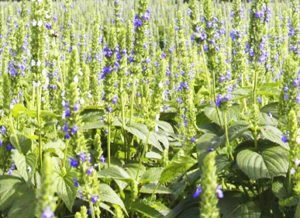 They have put on a ton of leaves and developed thick stems, but we have yet to see any of these beautiful violet blooms. This is our first attempt at growing winter squash. This is a climbing variety that we planted late spring and had a good germination rate. We also have a panel trellis set up for these to climb. 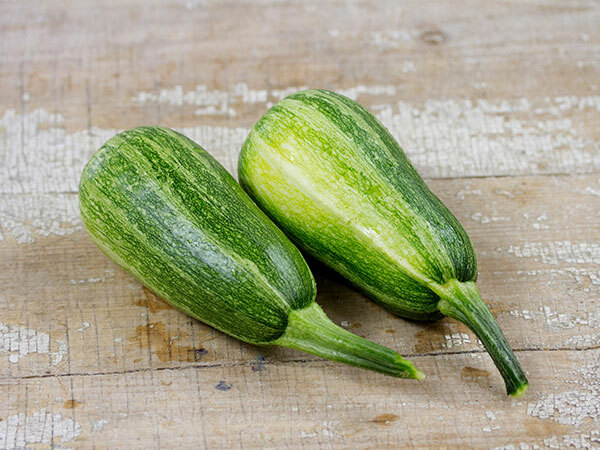 Winter squash have a longer shelf life and we hope to be storing and eating these for a while. We love all kinds of greens and we are excited about adding this one to the lineup. We planted these from seed directly into the soil, but in hindsight probably should have started them earlier in the greenhouse. The germination rate has been good and the range of stem colors are now starting to show. We encourage everyone to try at least one new crop in their garden every year. Growing things for the first time can be fun but challenging, and a mystery all at the same time. 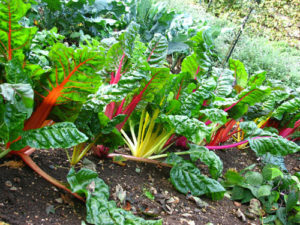 And if you’re lucky, what started as a trial might become your new favorite vegetable to grow!